This page will explain how to install WordPress and set up a blog site. You can set up WordPress on a new website or with an existing website – I’ll cover doing it both ways and you’ll even find out how to get WordPress installed for free. This guide is brought to you by TonyHerman.com. Your blog can be a personal website or even a full-blown business website – that’s how powerful WordPress is! Sites like Chicago Sun Times, The Walt Disney Company, the WNBA, Mercedes-Benz, The New Yorker and many more use WordPress. It’s best to have your own website with your own domain name and your own hosting – that way, you own your content. That’s the main reason and it’s HUGE! Yes, with some blogging platforms, when you write something and put it up, you no longer own it. Other reasons include that there are no ads running on your website (unless they are ads you put there, of course) and you have a lot more freedom. Some blogging platforms won’t let you advertise. Lastly, you have control. Even at WordPress.com (where they host it), if they don’t like what you’re posting, they can take your website down. I’ve had it happen and I lost all the content I put there. Automatically – This is super easy and takes less than 4 minutes (OPTION 1). Manually – This has more steps and is more complicated (OPTION 2). This article will go over both ways. Once it’s set up, you’re off and running with a new blog! If you’re installing a WordPress on a new site/domain, then skip to the next section. If you want to keep the same website hosting as your current website, then you should be able to do either option (although a sub-folder will be easier). If you want to choose different hosting, then you’ll need to go with a sub-domain and you cannot use the sub-folder method. Most people will choose to go with the sub-folder method and it’s honestly a little better for SEO (search engine optimization) reasons to go with the sub-folder method. If you want to add WordPress to a website you already have, then you should know that your website can be split up between different website hosts. Again, you will have to go with the sub-domain method if you want to do this – or else move the existing website to the new host along with the plans of installing WordPress. If you do not have website hosting, then you can easily buy a domain name and website hosting. People may choose to go with new hosting (versus their current host – if they have a website already) for various reasons. One reason might simply be because some website hosts make installing WordPress super easy while it’s a lot more work and more complicated with other website hosts. No matter what kind of website you already have running, you can easily add WordPress to it and it can appear under your domain name. All you’ll have to do is link to your added-on WordPress site once you have it up and running, which I’ll explain here. If you want to go with the sub-folder method and keep your same website hosting company, then here’s a good walk-through on how to set up WordPress so that it connects with your existing website. Basically, you’ll be setting up WordPress, just like normal but it’ll be right next to your current website, so let’s do that. You can’t have a space, so if you need to have separate words, you’ll want to use a dash. For example, “latest news” would have to be “latest-news” for that to work. I’d suggest not doing this simply because it’s hard or awkward to explain. Keeping it to one word is easiest. In the section where we install WordPress Manually, you’ll need to FTP into your website hosting account and create a new folder off of the main folder. If you do want to go with a new website host that’s really fast and one that makes installing WordPress really easy, then I would suggest A2 Hosting. I’ve got some websites hosted there and I love them. They’re perfect for WordPress blog websites and they’re support is simply outstanding. Like I said, it takes just a few minutes. That’s a video from my 7-day course. It gets into a how to really set up a good blog and make it successful. We’ll be doing the manual installation of WordPress, which has a few steps to follow. They’re not too difficult but it’s definitely not as easy as the video above. If you’re not sure, just ask your website host and they will let you know. This is what the “remote folder” or “remote path” setting will be if you’re given that information. You’ll enter the folder name (which will be a part of the URL, as discussed above). Next, go into that folder if you’re not in it already. This is where you’ll need to upload your WordPress files, so let’s put this aside a moment and go download WordPress. Look for the “Download WordPress x.x.x” button on the right side. The “x.x.x” will be the number of the latest version, of course. Click the button and a zip file will download to your computer. You’ll need to unzip the file. Go find the file that you just downloaded – it might be on your desktop, where you’ve set your browser to save files or where you chose to save the file. 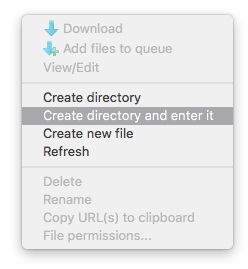 Right click on the file and choose to unzip the file or sometimes just double clicking it will unzip it (double clicking it on a Mac should work). 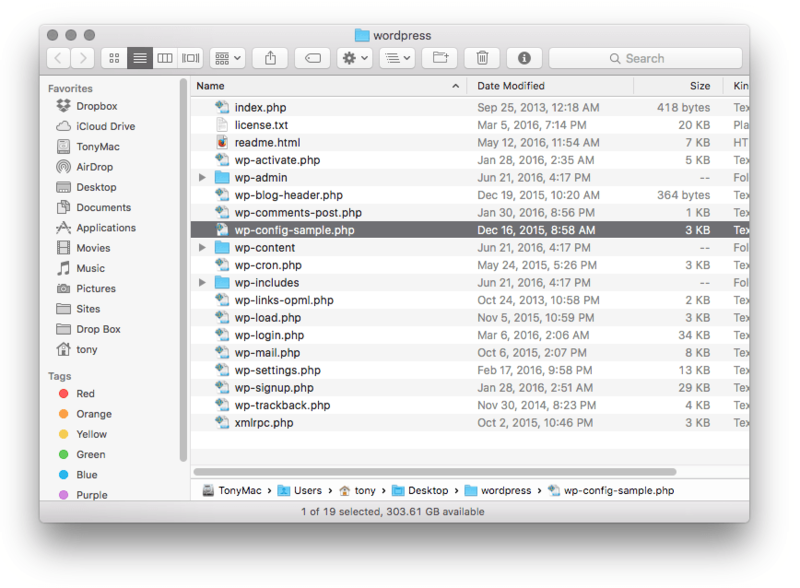 You should end up with a new folder called “WordPress” and you can safely delete the zip file if you still have it. 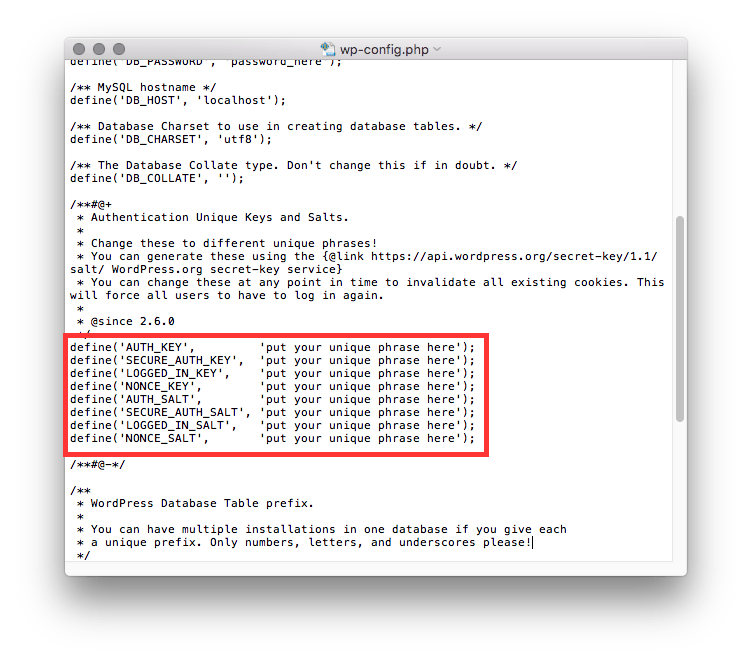 While the rest of the files are being uploaded, you’ll need to edit the “wp-config-sample.php” file with the database settings – but before doing that, we’ll need to create a database, database user and password. 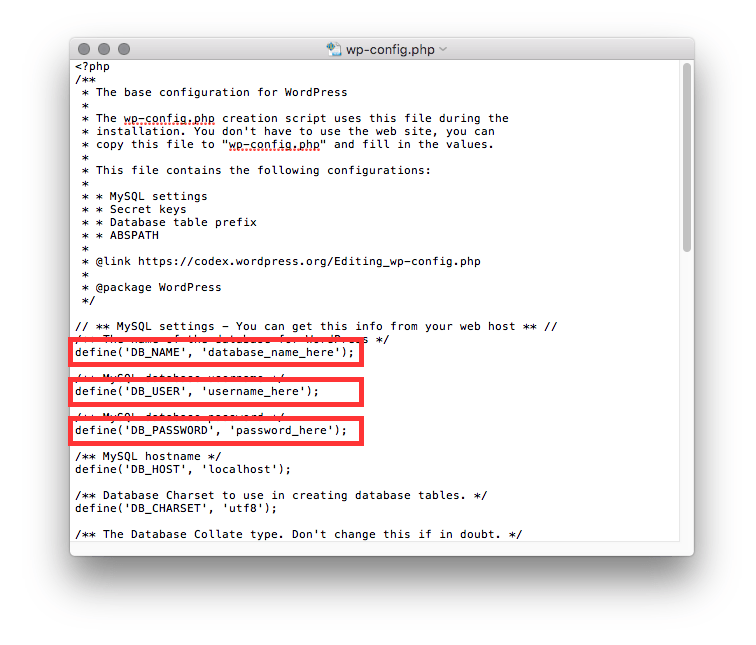 WordPress uses a database to organize content, settings and other things. Setting one up is pretty simple but it’s a few steps. Most people will be using hosting control panel software called cPanel, so I’ll give you instructions for that. There are other hosting control panel software platforms out there like Plesk and if you are not sure how to set up a database using one of those control panels, then just search for how to do it online and you should find something. The “galaxyta_” part is the username of my account. Your username may be different. You then get to choose what the second part of the database name will be. What you name it doesn’t really matter – you just want to stick to lower case letters. If you have a hosting account where you’ll set up a lot of websites, then it’s a good idea to name the database with a name that has something to do with your website (like the domain name minus the “.com” part) so that you can easily tell which database goes with which website. Click “Create Database” and you’ll be taken to another screen that shows it was made. You’ll need to note the name of the database, so I like to copy the name of it and put it into a blank text document. TIP: I always have a blank text document open and I use it dozens of times a day. I use it to write notes or clean up formatted text or whatever. On Windows, you’ll use Notepad (not WordPad) and on a Mac, I like to download and install TextWrangler since the TextEdit app does support formatted text and you don’t want that). 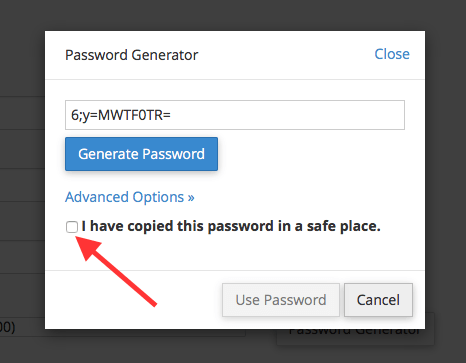 You will need to copy the password and paste it into your text file and then come back here and click the “I have copied this password in a safe place” checkbox in order to get the “Use Password” button to light up. They want to make sure you have this information saved because you won’t be able to see it again. It’ll create the user. Make sure you have copied the username and the password to your text file. Go back to the MySQL Databases again. The last thing to do is to give permission for the user we created to access the database we made or things just won’t work. Choose the user you made with the database you made (mine don’t match up here to what I showed you above – so just ignore that) and then click the “Add” button. Then click the “Make Changes” button and we’re all done with this step. 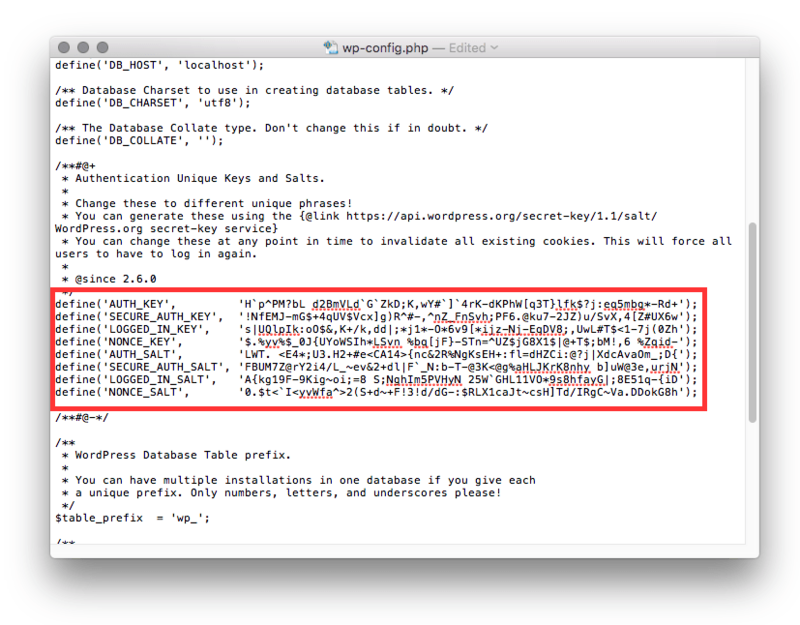 Remember the “wp-config-sample.php” file that I said you shouldn’t upload yet? Well, it’s time to change some settings in it so that we can upload it. So we just removed the “-sample” part of it. This file name needs to be named exactly like this or your website will not work. There are a few things in this file that we’ll edit. Open this file in a text editor like NotePad (Windows) or TextEdit (Mac) or TextWrangler (Mac). This file may look like a mess to you at first glance but it’s really not that difficult to read and if you’ve never seen code before, it’s time to get a little exposure to it. The first one (DB_NAME) is the database name. 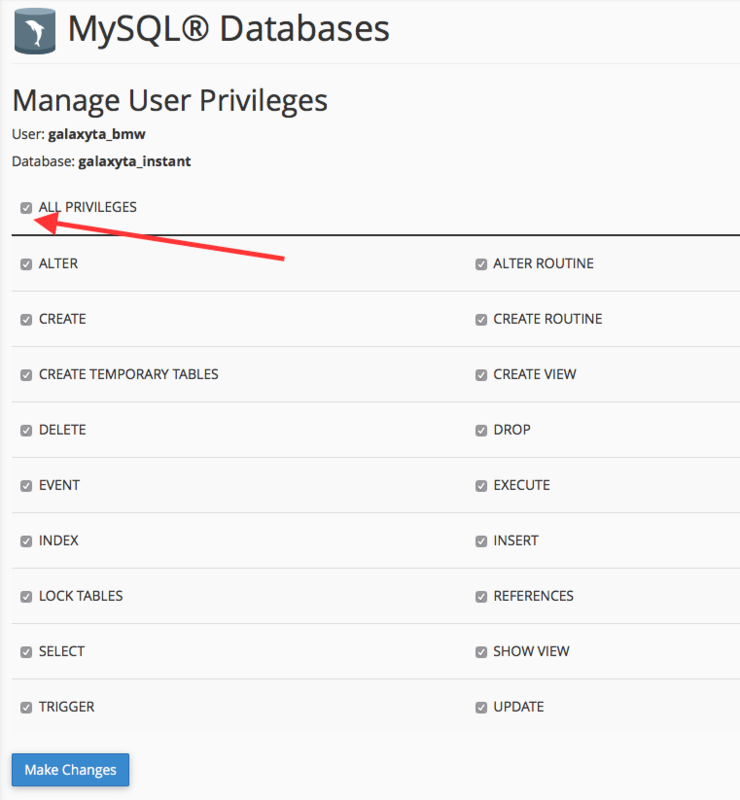 The second one (DB_USER) is the database username. The third one (DB_PASSWORD) is the database password. Then there’s one more section of this file we should edit – the secret keys. This is actually option but if you do it, your installation of WordPress will be more secure. It’s a set of random characters that are used to encrypt you website visitor’s cookies. What is does is make your password harder to crack. When you go there, a new set is randomly generated. You can refresh the page to see it change if you want. Now save the file and you can close it. Go back to your FTP program and upload this file to the server. Once all the files have been uploaded, there’s just one more, quick step… just go to your domain name (or directory if you installed it in a sub-folder, next to another website) and pull up the website. You should see a setup screen where you enter the name of your website/blog, your email address and a password. This is the final step to installing WordPress manually. If you did it the automatic way or the manual way, you should now be ready to login for the first time! And you would, of course, replace “yourdomain.com” with your domain name – which may or may not have a “www.” in front of it. If you installed your website the automatic way, then you should have been told what your unique (secret) URL is for logging in to WordPress. So login with your username and password, click the “Remember Me” checkbox so that you don’t have to keep logging in all the time and you’ll see the WordPress Dashboard, which might also be called the “back end” or the “administration area” of WordPress. 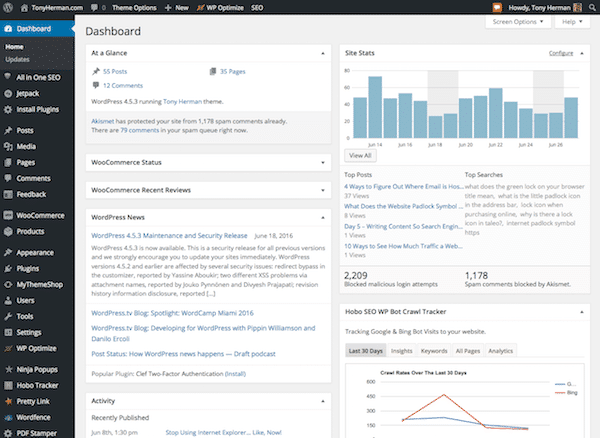 WordPress calls it the Dashboard, so that is what I’ll refer to is as. The WordPress Dashboard tells you a few things. You’ll see how many posts and pages you have, how many comments there are and then any important notices – like upgrades or something a plugin wants you to do. It contains the name of the website (click that to go to your website – I usually right click and open it in a new tab so that I have a tab open on both sides of the website), maybe some theme options, a way to add a new post (and more items), maybe a few more options and then your name, next to a “Howdy” from WordPress. Where your name is showing is where you can click to logout if you want. If you’re on a shared computer or public computer, then you will for sure want to logout when you are done working on your website. This is your navigation within the Dashboard. Feel free to click on some items to see what’s there. Since you have a new installation of WordPress, there isn’t a whole lot to look at but taking a look around will help you understand where things are. When you’re done doing that, go to the top left and click on “Dashboard” again to get back to the beginning. Now that your website is set up, I’ll take you through some settings to change, installing a theme, installing some plugins and then how to add pages and posts. Click on that link to send that item to the trash. and you’ll know what to do. On this page, you can set your website’s title and tagline. Go ahead and set the time zone and starting day of the week to what you prefer. For the rest of the settings, just stick to what is already there (the default settings). Do not change the “WordPress Address (URL)” or “Site Address (URL)” as this could cause your website to stop working and it’s not easy to fix this. The theme for your website is the design. The first thing to do is choose one that you like. There are many free themes to choose from or you can buy WordPress themes from many places. With free themes, you want to be careful and make sure it’s a good one. It should be set up right and not have any malware in it. The best place to find good, free themes is at WordPress.org. Choose themes with good reviews and lots of downloads. When you preview the theme, it’s probably not going to look very good because WordPress puts in some default text and it may not be put how that particular theme needs it to be put in (that’s the best way I can explain it). If you’re new to WordPress themes, then you’re best using one of the free, default WordPress themes that WordPress includes. They work well out of the box without much configuration. The downside is that they look pretty generic. But still, start with one of those themes to get use to how things work. Later, you can change themes and when you do that, you won’t lose information – just the design will change. The other option you have is to buy a theme. Most are pretty inexpensive. They range in price from about $12 on up to $97 or more. The paid themes I like the best are over at MyThemeShop.com. I also like themes at ThemeForest and they have a lot of them there. Default Theme – If you’re going to use the default WordPress theme, then you don’t have to do anything. Free/Paid Theme – If you’re using a theme you found or paid for, then you should have downloaded a zip file and have that on your desktop or somewhere on your computer. WordPress Installer – You can use the theme installer inside WordPress to search for and install the free themes at WordPress. I’ll explain that method first. And then click on the “Add New” button near the top. Use the filters at the top to view and look through themes. When you find one you like, find out more about it by clicking on it. There is then an “Install” button at the top, so just click it to download it to your website and install it. Next, activate it when you see the link to do so and it’ll be installed and activated. And then see what you can adjust. Then click the “Add New” button at the top. You can then browse for your zip file and then click “Install Now” to install it. WordPress plugins are add-in pieces of software that extend what WordPress can do. For example, you can install a calendar plugin to have a calendar on your website. As with themes, you can browse through the extensive library of plugins at WordPress or you can upload and install them yourself. It also works pretty much the same way as themes, too. You’re just in the Plugins area instead of the Themes area. and you’ll see the plugins you have installed. Some may be installed but not active. If you do not plan on using a plugin, you should remove it. I’ve seen plugins that were supposed to be inactive still technically running on a website. Also, the fewer the amount of plugins you have, the better – for security reasons. Here, you can see what the most popular plugins are, which ones are features or search for plugins – all from the WordPress library. Just browse your computer for the file and click “Install Now” to install it – again, much like themes. You’ll be presented with the option to activate it if you want to use it right away. Good plugin developers give you a nice, easy admin panel in the Settings menu on the left. More times than you would think, it can be difficult to find the admin settings for the plugin you just installed. Once in a while, there isn’t one. Look in the Settings menu if you haven’t done that yet. Look in the Tools menu or other menus. Go to the Settings > General page and see if the settings were put there. Go to the Plugins > Installed Plugins page, find the plugin and see if there’s a “Settings” link there. Go to the plugin’s page at WordPress (or click on the “Details” link) and then look through their installation instructions or documentation for clues. Worst case, email the plugin developer and ask for help. Adding new pages and posts is very simple in WordPress and once you have your website set up how you want, you’ll mainly be adding content to it to help it rank higher in search engine results. You’ll see a list of pages on your website. If you see a sample page there, you can delete it by hovering your mouse over the title of the page and then going to the “Delete” link that appears. As you install more plugins, the options here may change. For example, I have WooCommerce installed, so I can add new products, orders and coupons for my store. At the top is the title, followed by the editor. 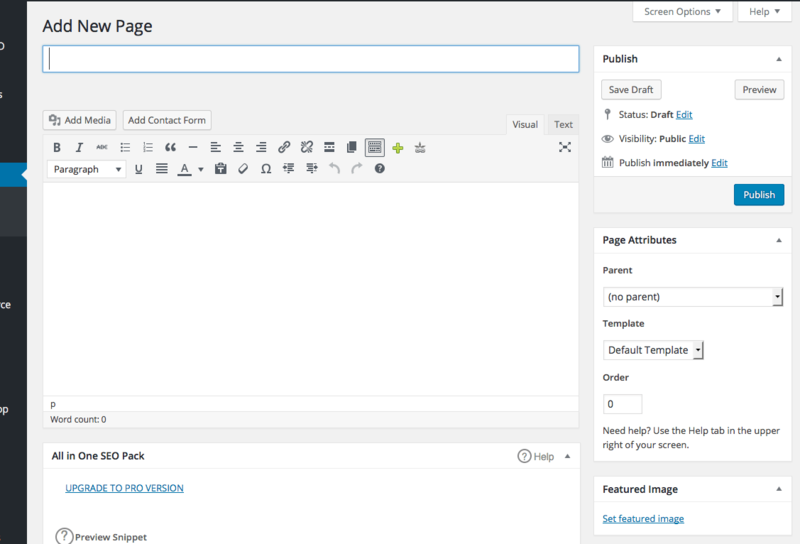 On the right are the buttons to save a draft, preview or publish followed by some page attributes and the featured image. I first usually add a title then get into writing content. I’ll then add images, proofread my content and then publish it when it’s ready by clicking the “Publish” button. If you want to save it and come back to finish it later, you can click “Save Draft” to save a copy. WordPress also does periodically save a copy of what you’re working on. You can then browse your computer to find the image to upload. When you’re done, click the “Back” button at the bottom. For alignment, I think right alignment makes the most sense… pretty much always. Either that or centered above the text. I like right alignment because it keeps all the text lined up on the left. That is how people are used to reading. Their eye gets to the end of the line and goes back to the left. If there’s an image there, it’s disrupting. With the text lined up on the left, the image on the right just compliments the text and makes for a pleasant reading experience that is professional looking… again, in my opinion – do what you want. If you want to add audio files, video, PDF files, Excel files or any other kind of file, just do the same thing but with files from your computer instead. I think it’s nice to change the link of the file (we call this the “anchor text”) and put “.pdf” on the end of it if it’s a PDF file and so on. This tells people it’s a link to file and not a link to another page. If you don’t have the software to do this, then you won’t be able to. Click the arrow to create the link. Check the “Open link in a new tab” to have it open in a new tab. Click “Add Link” when you are done. Of course, you can make text bold or italic, create lists, change alignment, add special characters or change text color, too. Put in some text and play around with the buttons and explore the editor. Headings are important. For SEO (search engine optimization) reasons, don’t use Heading 1 for a heading since your theme has already used it. You should just use that one once. You can use Headings 2, 3, 4 and 5 all you want (nobody uses heading 6 – the text is too small… I rarely used heading 4). Here is some preformatted text. Hitting the return key on your keyboard creates a new paragraph. Holding down the shift key and hitting return gives you a line break. With a line break, the text is in the same paragraph as the text above it and there’s no space between lines. You can have pages be under other pages. Doing this is good for website structure and search engines like it when pages are set up in a structure that makes sense. You can have pages be set to “(no parent)” – that’s perfectly fine. If you do happened to have pages the go deeper into a subject, then it’ll be good to make them child pages. The URL of the page may change, too, when do this… and that’s fine. It’s good. That’s about it for the editor and creating pages. I will add in more WordPress online tutorials here, so stay tuned. Posts get put in place for you automatically. Older posts get moved down. Posts don’t have parent/child pages. So everything is the same as pages except these things. Categories are good because you can group the same kind of content together. Use categories when you’re starting your website so that you don’t have to later move posts around. Tags are like hastags or keywords. I like to have one keyword per 100 words that I write. That’s about it for creating posts. I will add in more WordPress online tutorials here, so stay tuned. Something like that. This list can be whatever you want but it should make sense. Most websites have the “About” and “Contact” pages, so you should have those. A link to the home page is also necessary to help people get back to it. The rest of the links are up to you but try to put yourself in the shoes of the website visitor. It’s a good idea to look at other websites and see how they structure their navigation. Basically, put similar things together… since that makes sense. By default, your WordPress theme might be listing the pages you have made or it might be showing categories. If you haven’t set up menus yet, then you can usually override what your theme might be doing. You don’t have on the “create a new menu” link because the place to do it is already there but later on, if you’re creating more menus, that link might come in handy. Put in a name. What you choose doesn’t really matter since people won’t see it. I like to use “Primary Menu” or something like that. Click the “Create Menu” button. To now add something to your newly created menu, use the area on the left where you can choose pages, posts, links or categories. Let’s use pages as an example. Find a page to add and click the “Add to Menu” button after you have checked the box next to the one(s) you want to add. You can click on the down arrow on the right and more options will be shown. In the “Navigation Label” area, you are given a chance to rename it. You’re not renaming the page but you’re just choosing what name (label) it will have in the navigation. Now let’s add a blog category since this is a smart thing to do. A blog category page shows all the items in your blog or a category in your blog. You can highlight “Uncategorized” and change it to “Blog” or something like that. Set the “Link Text” to “Home” or whatever you want to call it. When you’re done editing your menu, you want to make sure the menu you’re creating actually ends up on the website, so where it says “Menu Settings” at the bottom, you’ll see the available menu areas that are in your theme. I’ll choose “Primary Navigation Menu” and then click “Save Menu” to set it there and save it. You can now look at your theme to see your menus showing up. Your website is on a public-accessible computer called a “server.” Did you catch that part about being public accessible? It has to be… the public needs to access it. The only downside to that is that the public can access it. Hackers are a part of the public. Secure the Dashboard by choosing a good username and password for your account. Do not use “admin” for the username. That’s the first one hackers are going to try. Don’t use your name, either. 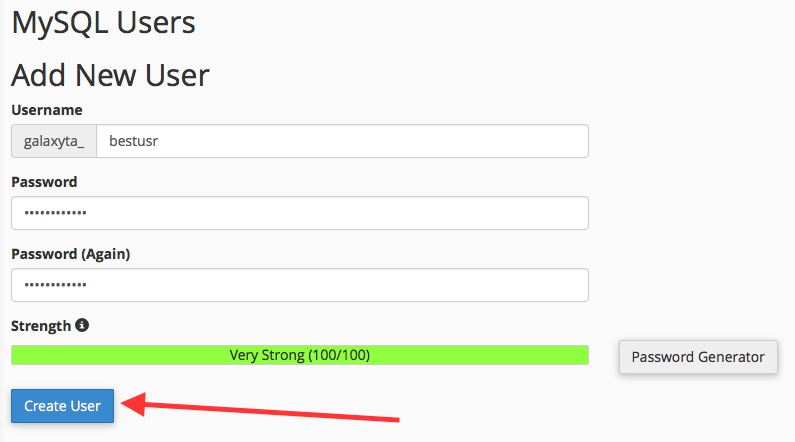 There’s an alias function in your user profile where your username and name displayed on articles can be different. You should definitely use this feature so that they are different. If you’re displaying your username on every article, then that’s just as bad (probably worse) than using “admin” for your username. For your password, use a long one and one that you basically need to copy and paste in order to remember. Your browser can store your account usernames and passwords, so use that feature or use an encrypted file on your computer or a password keeper type of software. WordPress has begun helping you generate nice, long, crazy-looking passwords for new accounts, so definitely use that feature. Get rid of that junk. That’s just more places where malicious files can be stored and more access points. Think about it this way – which do you think is more secure? The first one, of course. There are less entry points and it’s less area to cover. This is probably the most important tip and it’s easy to do. WordPress has made it easy to keep itself up to date with just a few clicks but it’s up to you do those clicks. You need to login at least once a week and check for updates. There are about 10-12 or so WordPress core file updates a year but plugins are updated all the time and thus need to be checked. The first thing to do in order to update your installation of WordPress is to take a backup of the website. You need a backup because when WordPress gets updated, files are overwritten. If an update happens and things stop working, you may even be locked out of your website and that’s not good – you might have to start all over again and you might even lose content. If you backup your files, you can always go back to your backup files in case something bad happens. Taking a backup is tedious work. It’s not fun but it’s definitely worth it just in case something bad happens. If you don’t back it up and there’s a problem, you’ll wish you did have a backup. If you don’t have one, then you need to rebuild your entire website and you may also lose some content, which is very valuable. There are 2 main parts to your website: the files and database. You should back both of them up. That way, if something does go wrong with the software updates, you have something to go back to. Some website hosts give you a way to back up an entire website (files and database) in their hosting control panel. Ask your host about this as it’s probably the easiest way to do it. Some hosts do backups for you where you can at least go back to where the website was last night. You need to backup your website files and the database to have a complete backup. Login to your control panel (named “cPanel”) from your website hosting account. Go the File Manager and find your website. You might have multiple websites. Usually, there’s a folder with the name of your website inside of the “www” or “public_html” folder. Next, you’ll compress the files so that all the files end up in one file. Click the “Compress” button. That will run and create a file on the server. You can download the file if you like. Next, you need a backup of the database. In the control panel again, look for the PHPMyAdmin icon and click it. Find your website’s database on the left. You might need to click on the plus sign to open up a folder and look deeper. Click on the database name and the panel on the right should change. At the top, there should be an “Export” tab – click on that. Keep it on “Quick” and then click “Go.” to start it. You’ll be asked to save the file on your computer. In WordPress 3.7 a new feature was set up that updates WordPress automatically in the background. That’s great but it only automatically apply minor updates from WordPress, not major updates – so not all of them will be done. Don’t rely on that and you need to make sure plugins are updated weekly. Then just click “Update” next to the items that need to be updated. You may need to come back to this page after you do an update to make sure they’ve all been taken care of. After doing updates, you should look through your website to make sure everything works fine. If not, you may need to get a restore done to the backups you have. Scared of Doing All This? If updating WordPress sounds scary or if you simply don’t have the time for it, then check out using website maintenance services where you can get help. My company also has a Website Care service where we check your website for you weekly and take care of all the updates for you. Ideally, you want a website host that is an expert. Most websites use WordPress, so any good web host out there will have experts on staff. You also want a host that cares about WordPress and cares about everyone on their servers keeping their software up to date – that’s the difference between a good neighborhood and a bad neighborhood when it comes to website hosting. Think of your hosting as an apartment building where all the apartments are on one floor. The building has a keyed entry and then every apartment is locked as well from the inside. You’re making sure you lock your doors and windows but your neighbor next door doesn’t. They have open windows and the door is cracked open. This invites thieves into your building. They’re not in your apartment yet but they are in the building and it won’t take long. A good website host has security guards walking around the complex. They’re checking to make sure everything’s locked up and secure. They’re looking for thieves and troublemakers. Get it now? Get the website host that has tough rules about software updates and security or get your own VPS (virtual private server), which would be comparable to getting your own house instead of living in an apartment building. If you have plugins you’re not using, it’s best to deactivate them and delete them. We’ve seen plugins that have been deactivated sometimes still running. Also, the more software you have running, the more can be compromised. The same goes for themes. If you have themes that came with WordPress or others that you’re not using, then delete them. Keep your website as clean and clutter-free as possible to help ensure it keeps running well. This article goes very in-depth and will guide you to making your WordPress installation as secure as possible. Feel free to save this image and use it yourself – my gift to you! What SSL does is encrypt the information from your website (web server) to the website visitor’s computer (or phone). The data being sent between the two will be encrypted so that it cannot be intercepted. This is different from securing your website from hackers (which I explained above) – it’s network security. Google also wants every website to be secure and they give you a little SEO boost for doing it. Every new website being developed now forces SSL on every page. It also increases trust, which is good for your company and brand. Previously, only pages like credit card forms or forms with sensitive information were secured but now all pages are. The good thing is that it’s now easier than ever. The two hurdles that used to be in the way of doing this were that first, a dedicated IP addresses was needed (versus a shared IP address) and that cost some money per month (usually) from your host. Secondly, SSL certificates used to be a little bit expensive. Now, you can get them for free and that is what we’re going to do here. The process to do this is simple and you don’t need much – just a free plugin and another website that’s out there. First, head over to the SSLForFree.com website. You don’t need an account but I find it’s convenient to create one because they help you keep track of when they expire and so forth, so create an account. Once you’ve created an account and logged in, go back to their home page and enter your website’s domain. You can enter the “www” version of your domain or the “non-www” version. This website will actually create an SSL certificate that works with both, so it doesn’t matter which one you enter. For my example here, we’re going to secure a website I have called helpwithfb.com, which is a website with some help questions and answers about using Facebook. Next, it’s giving you files to download and upload to a certain folder on your website using FTP. Click on the files to download them to your computer. It must be exactly like that with the dot at the beginning and the dash. There isn’t a dot in front of this one. And then go into that folder and upload the two files – both of them. You can test that it’s working and that you did it right by clicking on the links they give you. They’ll open in a new tab. The next step is to click on the “Download SSL Certificate” button. Make sure you leave the “I Have My Own CSR” check box unchecked. We’re not providing one (this way is a lot easier if you use cPanel). Scroll down on this page until you get to the “Install an SSL Website” section. Choose your domain from the list. As luck would have it, they match up! All you do here is copy from one page to the corresponding place on the other page. I like to do a Control-A to select all, then Control-C to copy and Control-V to paste (or the Command key on a Mac). You should select all of the text there – even the “—–BEGIN CERTIFICATE—–” type text you see at the beginning and end of each. The private key is important. You don not want to share that with anyone or let anyone see it. Next, click “Install Certificate” to install it on the selected domain. 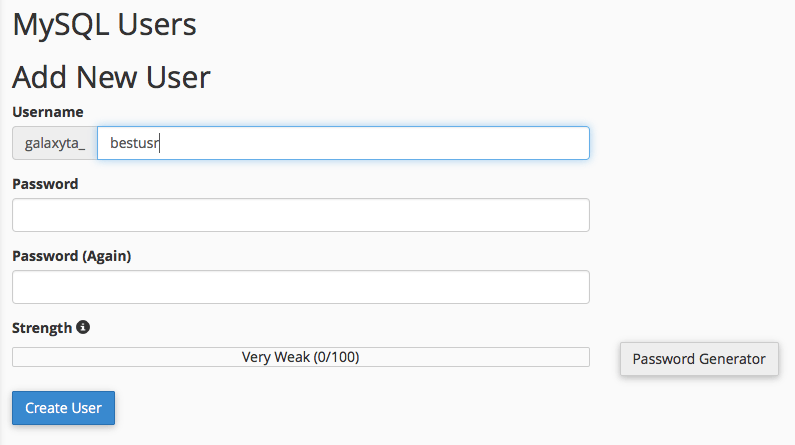 Next, go into the Dashboard of your WordPress website and install the Really Simple SSL plugin. All you’ll need to do now is click the “Go ahead, activate SSL!” button and your website will be set up, forcing SSL on all pages. Next, you’ll need to re-login to your website using the “https://” version of your WordPress Dashboard login URL. Speaking of security, you need to do your part and keep your version of WordPress up to date. Not only do you need to do the core WordPress software updates but you need to keep ALL your plugins and your theme up to date. This needs to be done weekly – at least. Your website is only as strong as its weakest link – just like a chain. Your website host should encourage you to keep your software up to date but it’s your job to do it since you installed the software on your website. If you need help with your website, contact the Maintenance Department at Webstix, which is there to help WordPress website owners. It’s my company and we provide very good service. There’s even an offer for new customers. The best thing you can do to get your website to rank well is to add great content. A blog is a tool – it’s there to make it easy for you to add new content and have it show up in the right place. Use that tool. Well, this page is quite a bit longer than I thought it was going to be but I wanted to comprehensively cover how to install WordPress (either by itself or next to an existing website) and how to use it. If you’ve never set up a website before, this might seem a bit overwhelming to you. If so, then relax. Just go through things, step-by-step. If something isn’t exactly like I’ve written here, then just click around and see what you can be find – don’t be afraid to click around and explore… that’s how you learn. We were all at this point at one time where we didn’t know what to do but everyone that can do this just learned how to do it. You’ll get there. Bookmark this page and refer to it. Read through it a few times. If you have questions, leave them below and I’ll try to help you or point you to a place where you can find help. Good luck!